The all-new BMW M6 Gran Coupe, the ultimate four-door high performance sports coupe, launched in India at the new BMW Group Training Centre. "Seemingly unstoppable, compellingly sporty, a singular presence - the all-new BMW M6 Gran Coupe does not follow conventional rules, it sets new standards. What makes the all-new BMW M6 Gran Coupe particularly extraordinary is its combination of superior elegance with the comfort and functionality of a four-door saloon and its prowess as a top-class high-performance sports car. 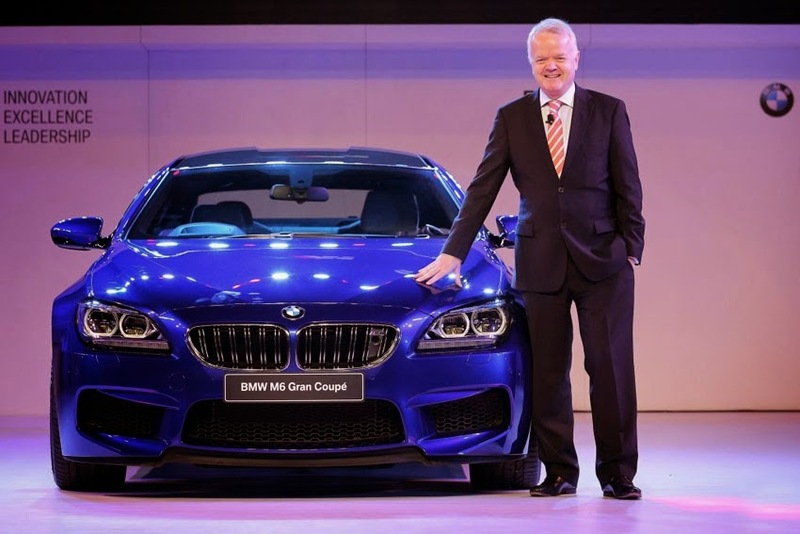 With its dynamic expression and luxurious appearance, the all-new BMW M6 Gran Coupe is not just the most attractive coupe in its class, it also provides the best everyday usability," said Philipp von Sahr, President, BMW Group India. The new flagship of BMW M, the all-new BMW M6 Gran Coupe is a vision of poise and assurance combining hallmark M high-performance refinement with captivating aesthetics, an opulent ambience and a comfortably-sized cabin with ample space even for rear passengers. The all-new BMW M6 Gran Coupe boasts extraordinary presence and breathtaking design with sporty and elongated lines and many M-specific characteristics. The front is dominated by large air inlets, Adaptive LED Headlights and the redesigned double-slat M kidney grille in chrome with M6 badge. The low roofline flowing smoothly into the rear, the swage line and side windows extending well into the C-pillars accentuate the dynamically stretched silhouette. The aerodynamically optimised exterior mirrors and exclusive 20-inch M light-alloy wheels in double-spoke design underline the car's distinctive appearance, as does another M signature - twin exhaust tailpipes positioned on the outer edges of the rear apron. The diffuser in the rear apron, crafted from Carbon-Fibre-Reinforced Plastic (CFRP), optimises under-body airflow. The interior of the all-new BMW M6 Gran Coupe presents a compelling combination of elegance and uncompromising driver-orientated ergonomics. The latest M cockpit technology has striking features such as the multifunction M leather steering wheel; the M centre console, which is inclined slightly towards the driver, has controls for different M driving dynamics systems and the instrument cluster display. Standard M seats with electric adjustment already promise optimum comfort, while M multifunction active seats with climate control are available on request. Another highlight of the all-new BMW M6 Gran Coupe is the roof, made of CFRP, which is a unique feature in this segment. The extremely lightweight design provides superior torsional stiffness and reduces weight by 25 kg compared to that of a conventional glass sunroof. The all-new BMW M6 Gran Coupe provides the kind of spaciousness that is far from the usual coupe fare. A through-loading hatch and 60:40-split folding rear seatback further provide an excellent everyday usability. The M TwinPower Turbo eight-cylinder petrol engine in the all-new BMW M6 Gran Coupe is the most powerful of all the standard BMW engines and is distinguished by its enormous performance, outstanding power delivery, running smoothness and free-revving character. The 4.4-litre V8 engine with M TwinPower Turbo technology combines two TwinScroll turbochargers with Valvetronic, Double-VANOS and High Precision Injection to develop an output of 412 kw/560 hp and an impressive torque of 680 nm. The sprint from 0 to 100 km/hr takes 4.2 seconds and top speed is 250 km/h. The seven-speed M Double Clutch transmission with Drivelogic ensures fast gearshifts without loss of power. Drivelogic also includes adjustable shift characteristics, a Low Speed Assistance system with a crawl function for increased comfort in stop-and-go traffic, a Launch Control system and an automatic 'P' function. Motor sport-style shift paddles directly on the steering wheel allow the driver to engage all seven gears without having to lift off the accelerator. The all-new BMW M6 Gran Coupe with state-of-the-art safety features provides maximum support in any situation with six air bags, Active M Differential, M Dynamic Damper Control, M Dynamic mode, M Compound Brakes, Active Protection with Attention Assist and Active headrests (front). The all-new BMW M6 Gran Coupe also features two M Drive buttons on the steering wheel for pre-programmed configurations for either a sporty or a comfortable drive. With BMW EfficientDynamics, the all-new BMW M6 Gran Coupe sets benchmark when it comes to the performance-to-fuel-consumption ratio equipped with a comprehensive technology package including features such as Intelligent Lightweight Construction, Automatic Start/Stop function, Brake Energy Regeneration, Electric Power Steering, 50:50 Weight Distribution and many other innovative technologies. The all-new BMW M6 Gran Coupe has a plethora of BMW ConnectedDrive driver assist systems and services. These include the next generation of BMW iDrive (the on-board Driver Information System) with touch controller, BMW Navigation Professional (integrated Global Positioning System - GPS) with 10.2-inch colour display with 3D maps, full-colour BMW Head-Up Display with M-specific views, Connectivity through Bluetooth and USB devices, high-end Surround Sound system from Bang & Olufsen and BMW Apps. Park Distance Control (PDC) rear and front along with rear-view camera come as standard features in the all-new BMW M6 Gran Coupe. The all-new BMW M6 Gran Coupe will be available in alpine white as non-metallic paintwork and in the following eight metallic paintworks - black sapphire, silverstone, space grey, san marino blue, sakhir orange, havanna, singapore grey and imperial blue brilliant effect. The all-new BMW M6 Gran Coupe is available in a petrol variant at an all India ex-showroom price of Rs. 17,540,000. Price prevailing at the time of invoicing will be applicable. Delivery will be made ex-showroom. Ex-showroom prices (inclusive of VAT@12.5 per cent) but excludes Road Tax, RTO statutory taxes/fees, Insurance and Octroi (if applicable).VAT over and above 12.5 per cent, if applicable, will be charged extra. Prices and options are subject to change without prior notice.